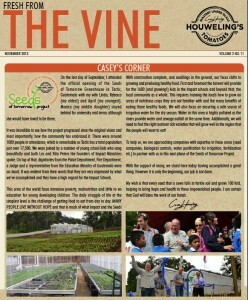 With the holiday season fast approaching, the November issue of “The Vine” celebrates the building of a community. 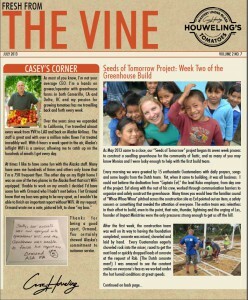 Casey reflects on the impact the Seeds of Tomorrow project has had on the community of Tactic, his family and his vision of a sustainable world. 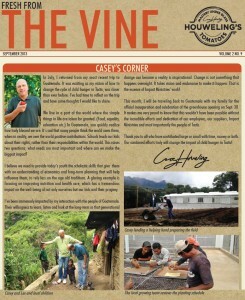 The September issue of “The Vine” brings us a reflection from Casey’s recent trip to Tactic, Guatemala where he shares his thoughts on the progress of the “Seeds of Tomorrow” project, the people of Tactic and the social responsibility that people have to their communities. 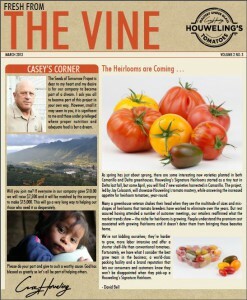 July brings another edition of the Houweling’s Tomatoes Vine Online and this month you can follow week 2 of our “Seeds of Tomorrow” project. 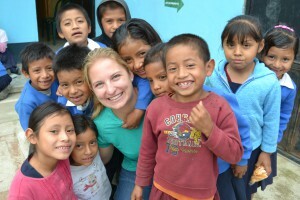 We highlight the journey of two Houweling’s team members as they share their experience of building a greenhouse in Tactic, Guatemala.